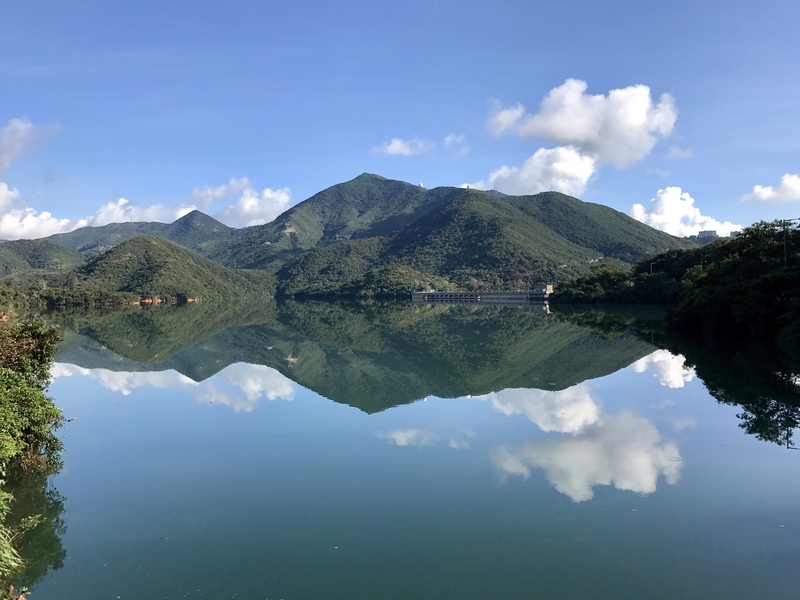 This blog is on one of my favourite hikes on Hong Kong Island. It’s a very picturesque hike with lush greenery and lovely rock structures and of course the beautiful rock formation of a Dinosaur head chewing grass. How to get there: From Sai Wan Ho MTR exit A turn to your left and cross the road. You will pass the Sai Wan Ho market where loads of vendors sell fish, meat, vegetables and fruits. Keep walking. Once you come to a Park and shop, cross the road and take the escalators that go upwards. You will reach the top and sight the IKEA Pick up point, exit there and turn right and keep walking up the slope. Taking the escalator through that mini mall saves time and you can reach the trail faster. Keep walking and you will come to the Shaukeiwan sit out area, walk past that and climb the steps. Keep climbing till just before you see the Shaukeiwan Reservoir, to your right you will see a little opening into the trail. Just keep walking and enjoy the lovely sights and sounds. There are a few steps so it could be a bit tiring for newcomers or for those who don’t like climbing. But do try, you will enjoy as there’s a lovely sitting area where you can enjoy a cup of hot tea and some sandwiches whilst you take in the views. You will be able to see Mount Parker and also lovely fir trees adorning those hills across. For those who love flowers, you will come across beautiful ones along the way. Keep walking and follow the rugged path ahead. You will pass by many rock structures along the way. Was happy to spot this lil’ guy perched proudly atop a tree. Keep walking, it is a long walk but extremely enjoyable..
And here is the Dinosaur head….fantastic isn’t it. You will come across few streams on the hike. But there are plenty during the rains. It’s a rocky road ahead but you’ll love it…. the rugged path makes it more interesting. Keep walking and at the end of the trail, you will join Mount Parker. Keep walking downwards till the exit. And that’s the end of the hike. Do try it, it is really lovely….bliss in the mountains amidst nature.